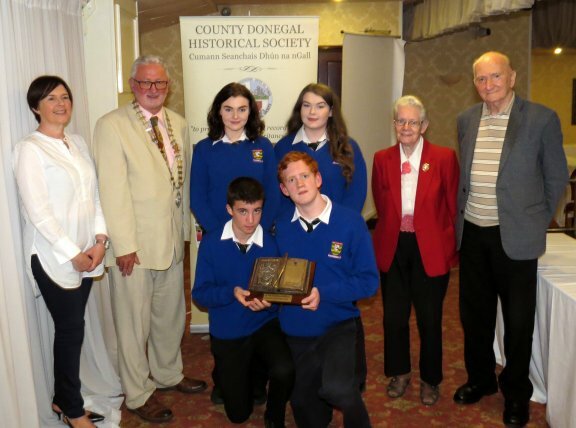 "Virtually 1916" was the theme for this year's schools' competition organised by the County Donegal Historical Society. Over 40 entries were received, in what is believed to be the largest amount ever in the more than 50 years of the competition. All historical happenings from that year were the focus of the project and the results were truly impressive. Pupils produced their own newspaper; 4 pages for individual entrants and 8 pages for class contributions. They inserted local snippets of information from their locality and included advertisements for Donegal shops and businesses in existence at the time.There was full scope for global, national and local events and the judges must be lauded for the huge commitment that this year's competition entailed. Gone are the days of entries being submitted in scrapbooks. Not for the computer-literate skills of the scholars these days. Their academic research and production skills on Word and Publisher were a joy to behold. 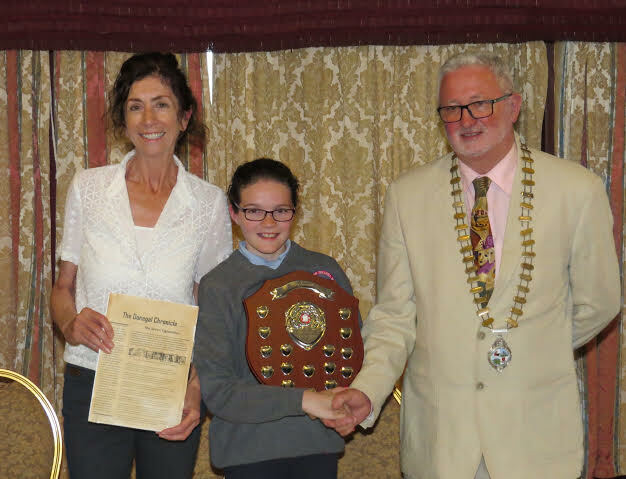 President of the Society, Dr. Lochlann McGill welcomed the large attendance of about 250 pupils, teachers and parents to the event in Jackson's Hotel. He began by complimenting all concerned on the superb standard of the entries. Samples of all entries were projected on a large screen for those present to enjoy and compare. The MC for the evening, Pat Shallow, a teacher at the Royal and Prior, has been involved in this competition for about 25 years. He wasted no time in making the announcements that all present had come to hear and he too admitted that the standards were truly amazing and a credit to all concerned. Dr McGill then surprised Pat with a gift from the Society committee in recognition of his many years of dedicated service to the competition. 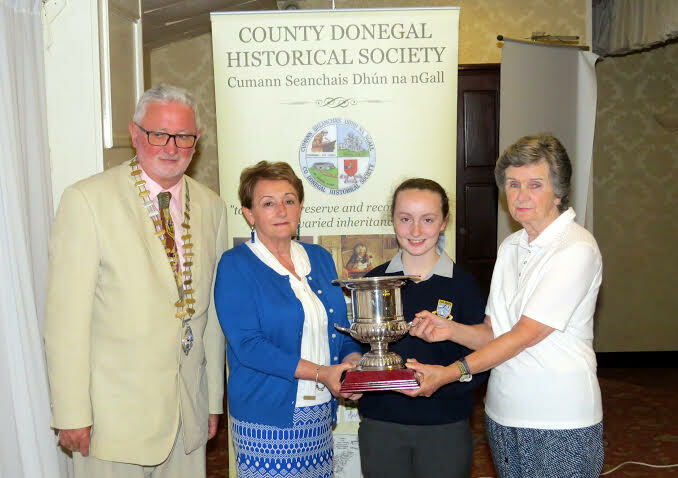 The Society is also indebted to Judith McCarthy, Curator of the County Museum and Joseph Gallagher, Donegal Heritage Officer, who contributed immensely to the success of the competition this year. The evening finished with complimentary refreshments for all. During the week the schools' sub-committee met to plan next year's competition and details will be sent out to schools after the Summer break. 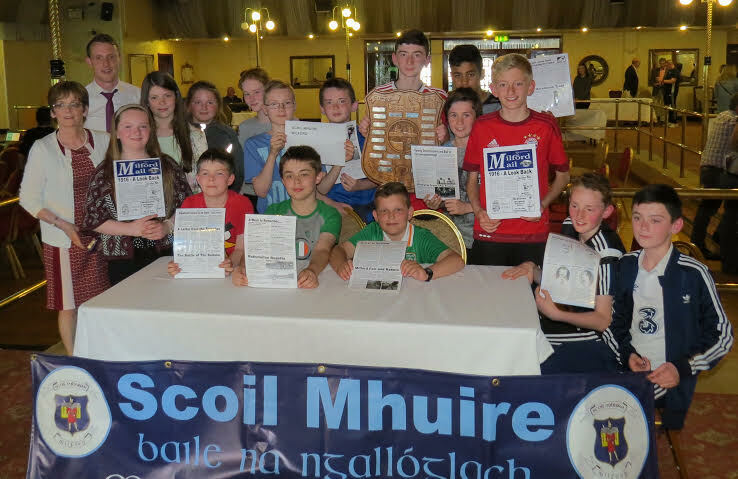 Gairmscoil Chú Uladh, winners of the Fr. Fitzgerald Memorial Trophy with some of Fr. Fitzgerald's relatives.